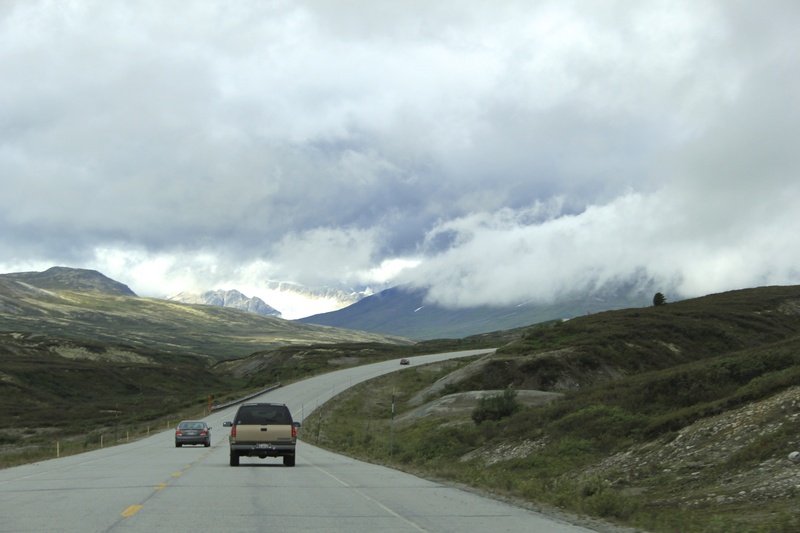 Journey to Alaska: Let the Roadtrip Begin! The wake up call my last day on the ferry was definitely early but not so bright. 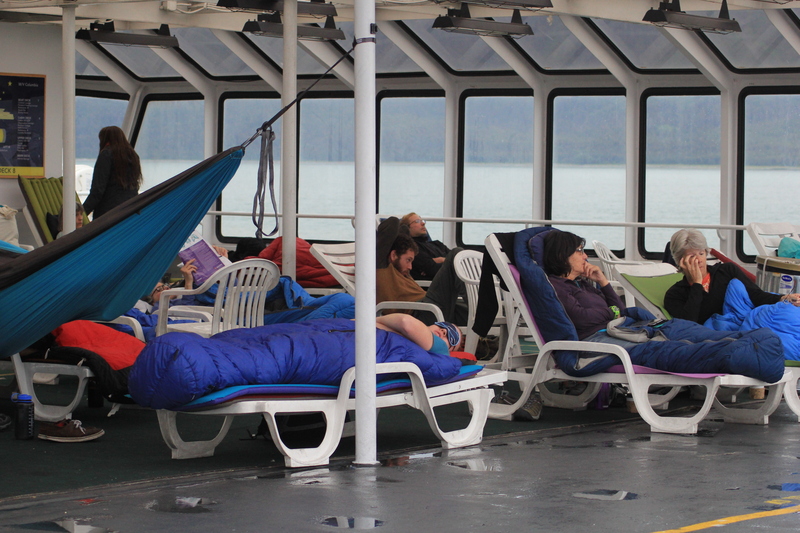 We officially docked in Juneau (well, 12 miles outside the city actually) at 3:30 in the morning, and, despite the early hour the purser still came over the loud-speaker to announce our arrival, of course waking me up. I think most others fell back asleep, I tried but for some reason I couldn’t. 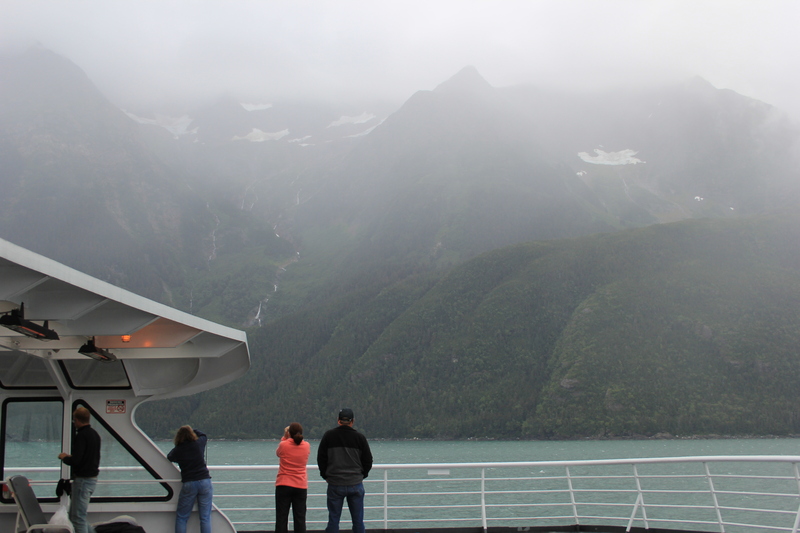 Even though Alaska is “the land of the midnight sun,” this part of Alaska, and at this time of the year still has darkness early in the morning so there wasn’t a lot to see off the ship, so instead I just people watched, people getting on, people getting off, making up stories in my head of where everyone was going. 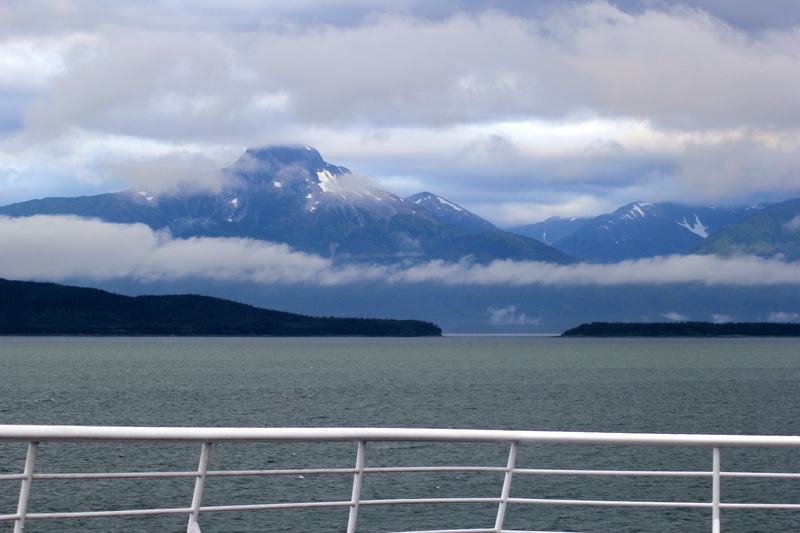 At 5:30 we finally pulled away and were on our way to Haines, my departure port. Sometime during the night we had outrun the rain so I kept my fingers crossed that it would stay away. 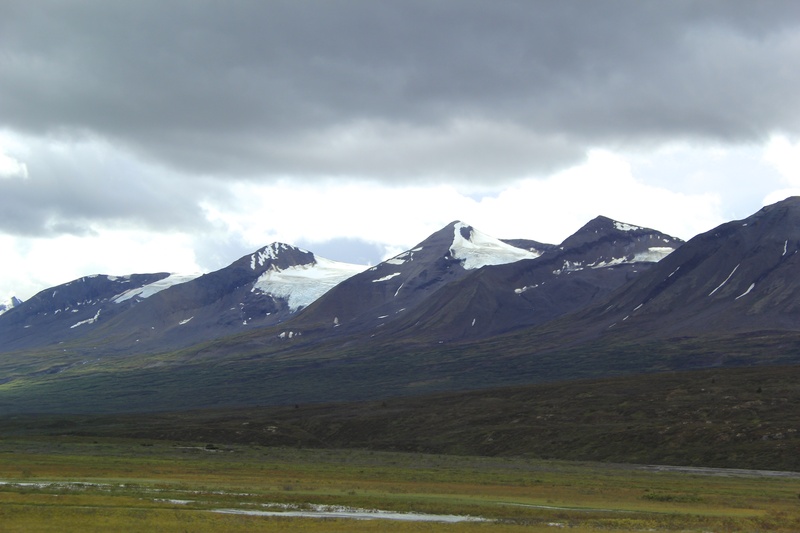 I had heard that this was the most beautiful section of the journey with snow-capped mountains and glaciers. unfortunately, even though the majority of the 4 hour journey was rain free, low clouds and fog made visibility poor. Every now and again we would see something spectacular peek through a crack, but that was it, a small peek. The first peek that there were good things behind all the clouds. And sometimes the clouds would part a little more to show something even more spectacular. Hanging out in the Solarium. 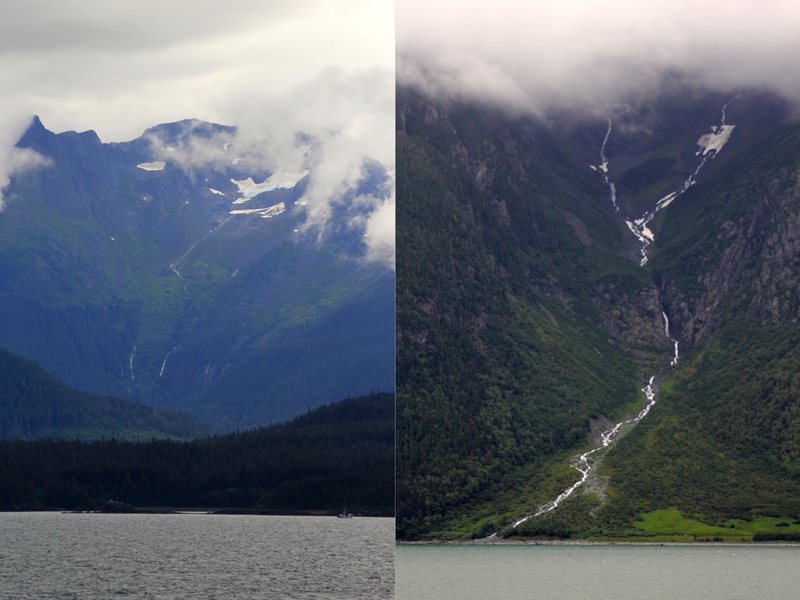 As we approached Haines my heart began to sink a little. It was that same feeling you get when vacation is over and you know you have to go back to work. Even though the ferry was far from luxury it was nice to allow someone else to do all the work for me for a few days while I sat back, read, took pictures and talked with new friends. Even though I was excited to get to Soldotna I knew it was going to take a lot of work to get there and I would be by myself most of that time, so I just wasn’t looking forward to it. 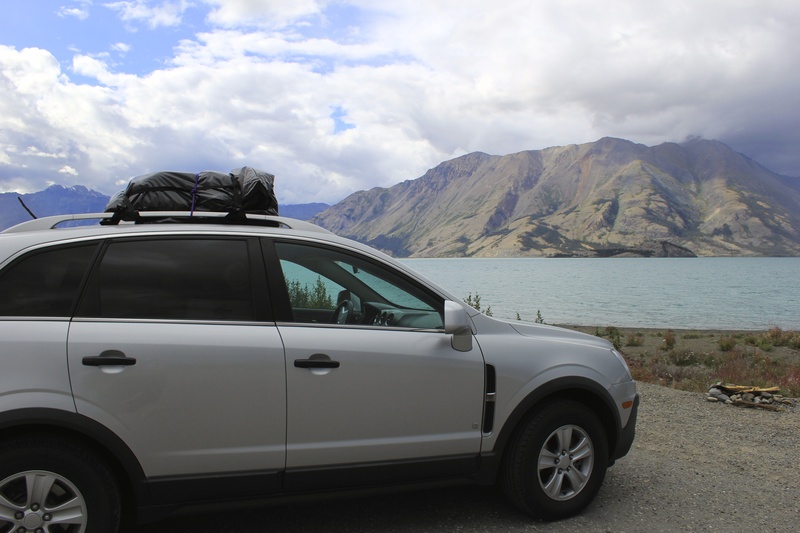 As we pulled into Haines, new friends helped me carry my ungodly amount of items down to my car, making the three deck journey infinitely less painful. I wasn’t sure how long they would give us before we needed to be off the ship so I wanted to make sure I was loaded up as quickly as possible. It seems that I forgot the whole car elevator part though, because it was a good hour before I was off the ship. I made a quick stop in Haines to give my Mom a call to let her know I was alive before crossing into Canada and then I was on my way. 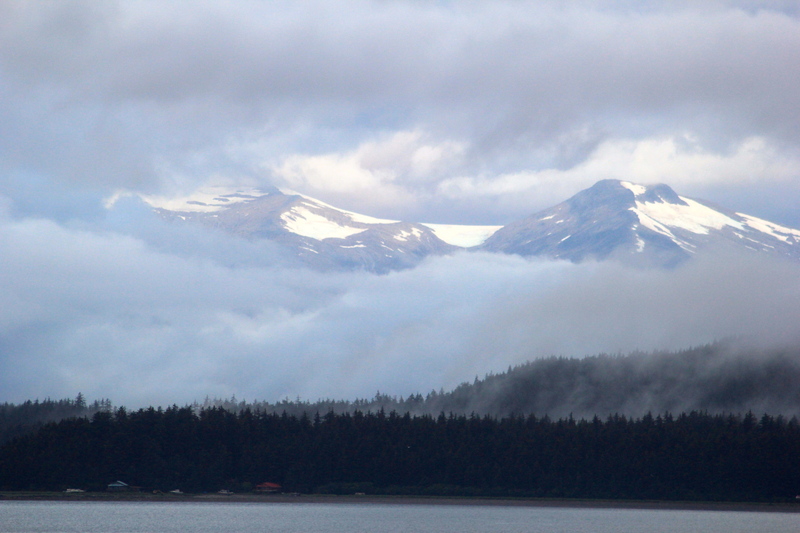 The further I drove away from Haines the nicer the weather got, Thank goodness! I drove through an eagle sanctuary, where I didn’t see a single eagle (come on!) and 40 miles down the road officially crossed into British Columbia. 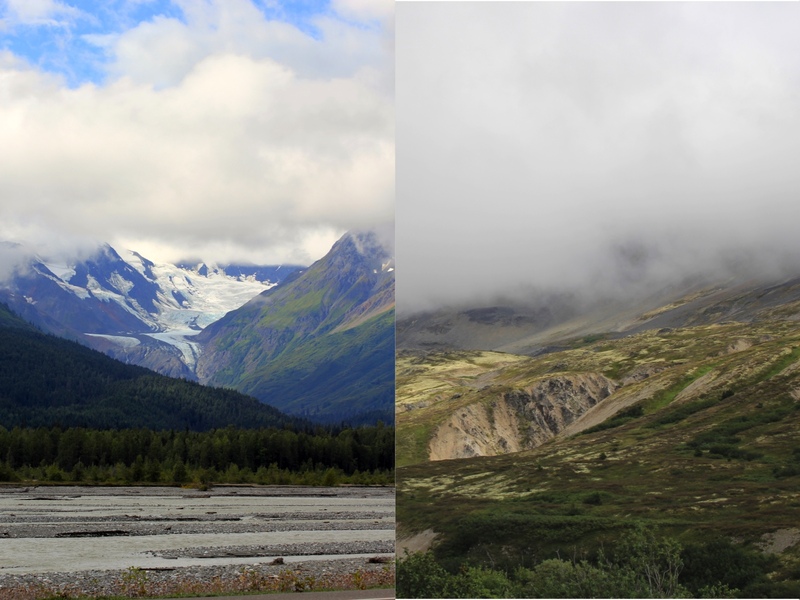 Tatshenshini-Alsek Provincial Park, which covers essentially the entire drive through BC along the Haines Highway is INSANE. I don’t think I could ever think of the correct words to describe it or ever take a picture that would do it justice. It was an otherworldly beauty. Like being on top of the world, far above any tree-line, and the glaciers, oh the glaciers. There were dozens of them. Everywhere I turned there was a new glacier. Guys, if you ever get a chance to drive this highway through the park, do it. It’s so worth it. You can just see a glacier straight ahead. I haven’t even edited this picture, these vivid colors were real. It was amazing. 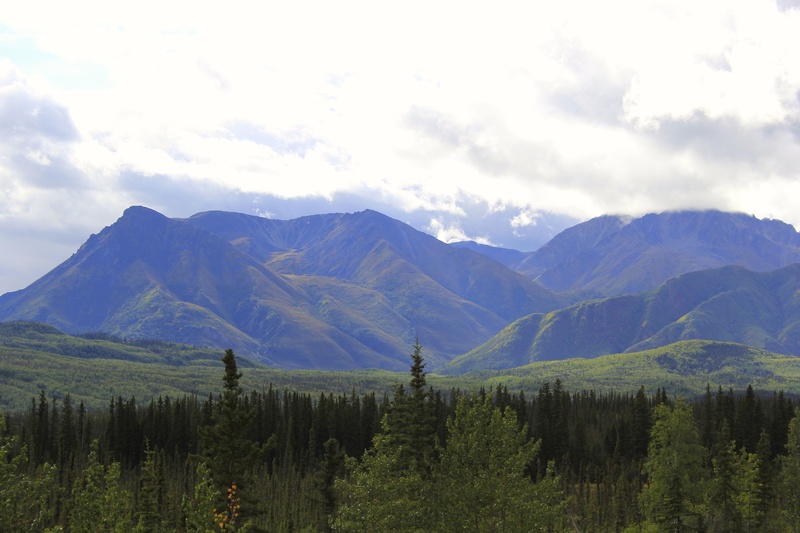 I was a little sad to leave the park but as I continued into the Yukon it was still beautiful, different, but beautiful, and just so you know, everything you’ve ever thought about the Yukon, you know, that no one lives there and that its vast stretches of empty wilderness, ya, it’s all true. 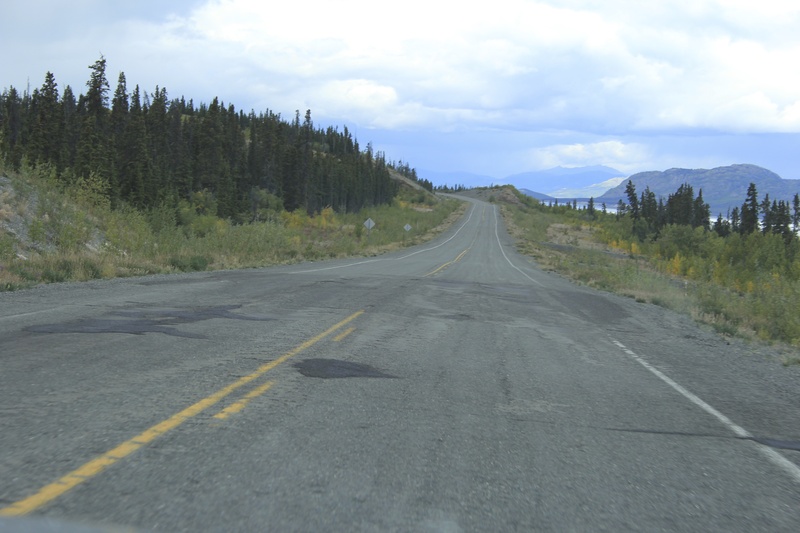 I felt like I pushed forever just to reach Haines Junction, the point where I would meet up with the Alaska Highway. I thought I would find a nice little town when I got there, but seriously, blink and you’d miss it. I was so confused. It’s definitely not a town that you need to spend any time in. I filled up my gas tank and headed on my way. 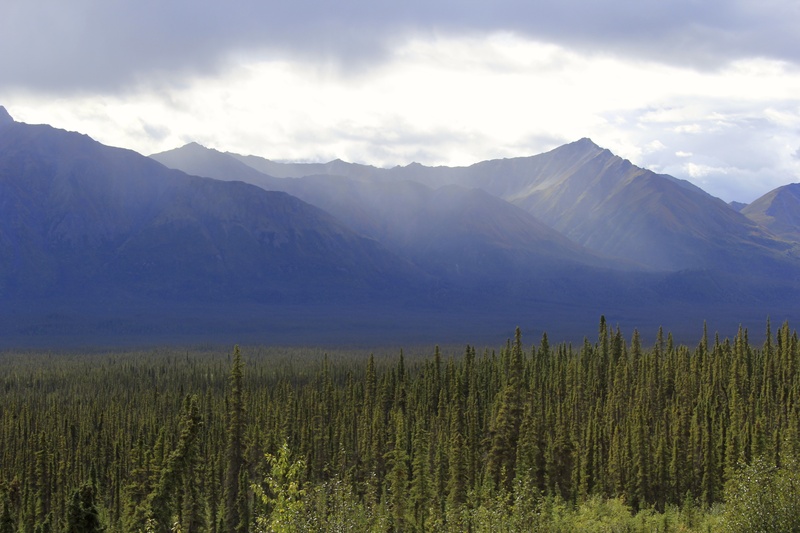 The sunshine in Yukon was a vast change from the rainy weather that morning. 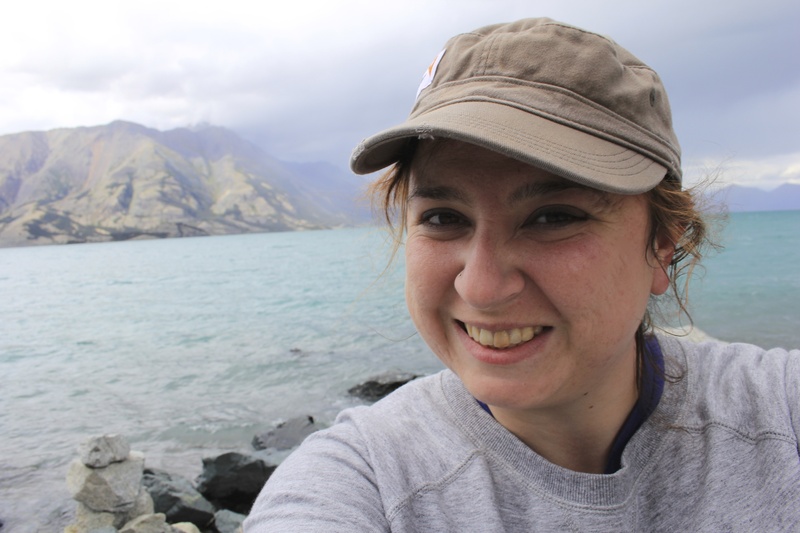 About 45 minutes down the road I officially made it to Lake Kluane, the Yukon’s biggest lake, and it definitely lived up to all my expectations. It was beautiful (and freezing!). 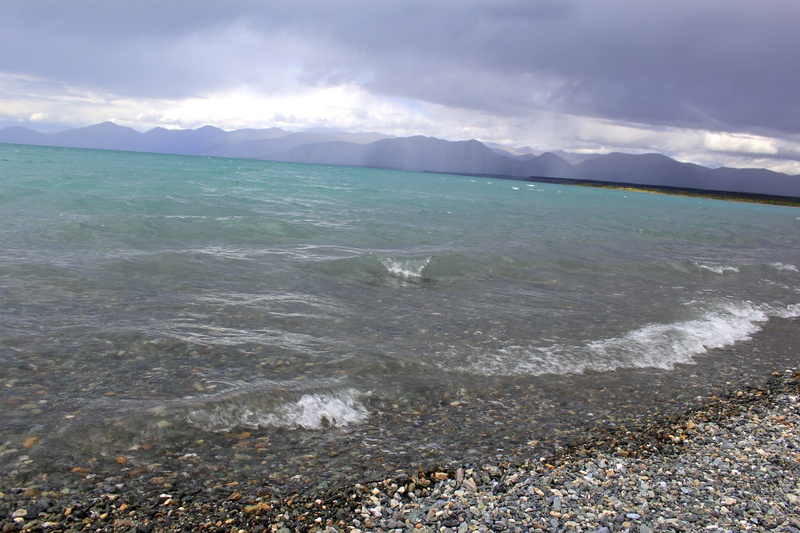 The water was a pretty glacial blue, so photogenic, so I found a place where I could pull over and take some photos. I could have honestly spent hours there but I had no idea how long it would take me to reach my campground for the night. 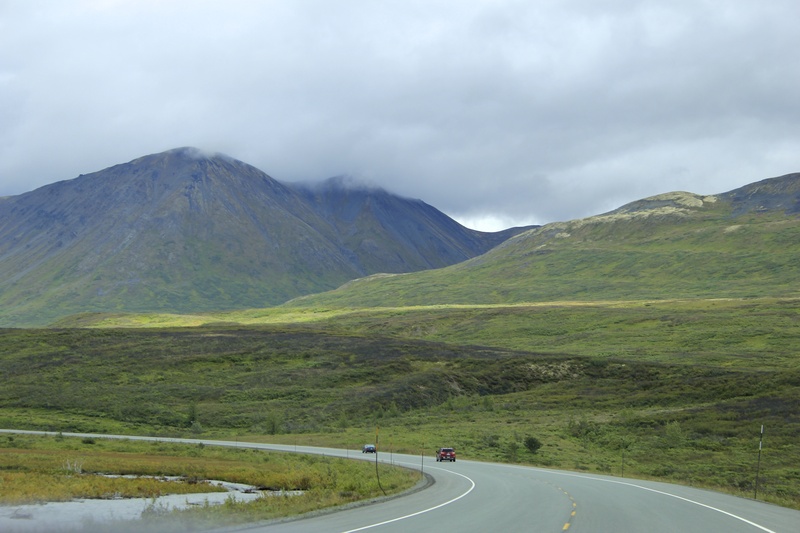 I’d heard this would be the most difficult portion of the Alaska Highway to drive (and boy was it rough), so I wanted to make sure to give myself enough time. 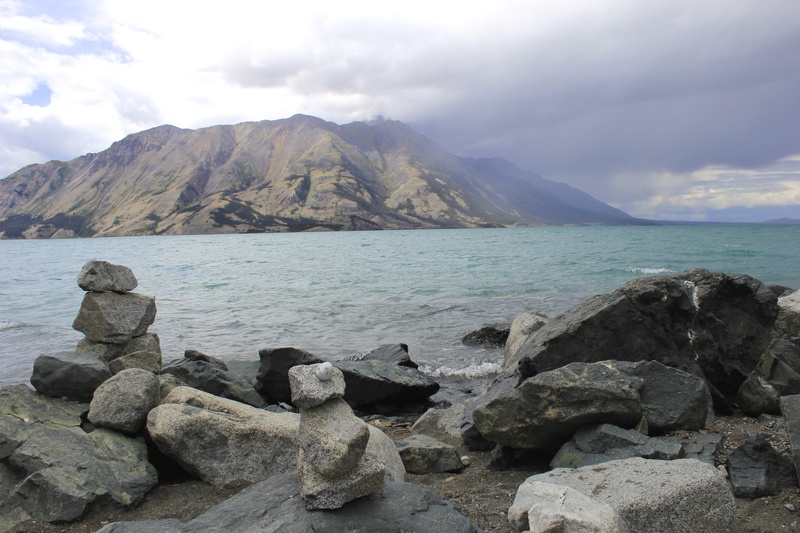 Lake Kluane with a couple cairns stacked in front. Look at the color of the water. So, so pretty. 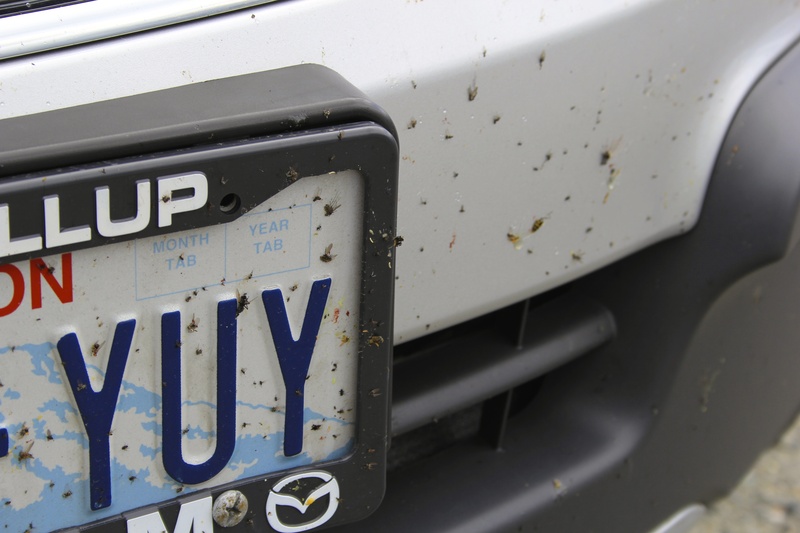 The bugs in Yukon y’all, there were SO MANY! My windshield was gross. Not even 30 seconds down the road, I look out my window and what do I see playing on the shores of the lake? A big ‘ole brown bear (Aka grizzly). It’s a good thing the road was empty because I slammed on my breaks and yelled “that’s a grizzly!” out of sheer excitement. I didn’t stop and take any pictures, although looking back I wish I had, but it was a pretty cool site and one of only a couple of wildlife sittings I had on the whole drive (the other was a group of wild horses about an hour down the road). 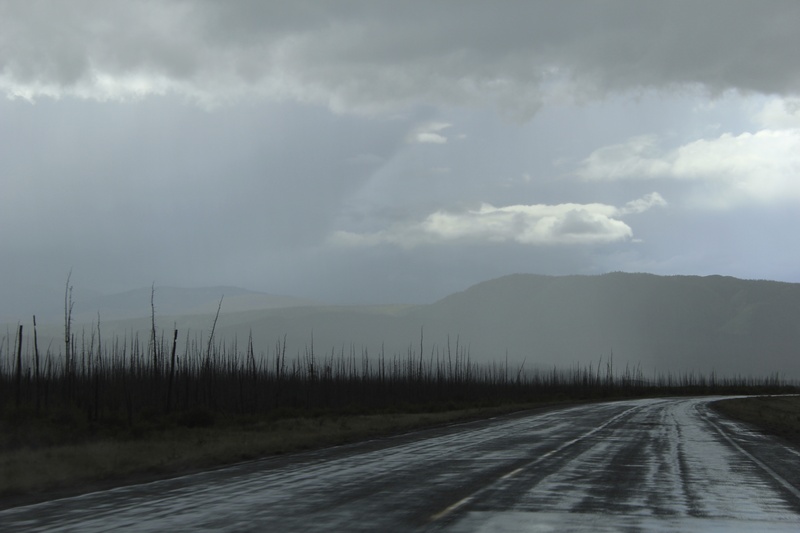 The rest of the drive was pretty uneventful although very rainy. I swear, I just couldn’t escape the stuff. The road was terrible in many spots. This is a small taste. Later on it was full on gravel. The rain would come in swift and hard. Then it would be as if the sun had never left. I ended up pulling into my campground around 5, it wasn’t raining at the time but the sky showed a real potential for it and I wasn’t excited in the least to set up my tent and spend the night in it, so when the owner of the campground offered to rent me one of their hard sided tents (it was only $10/night more) I jumped at the chance. To have walls, a floor and a real bed? Not a bad deal. I moved in, cooked myself a bowl of ramen noodles for dinner and watched a movie, simply because I could. 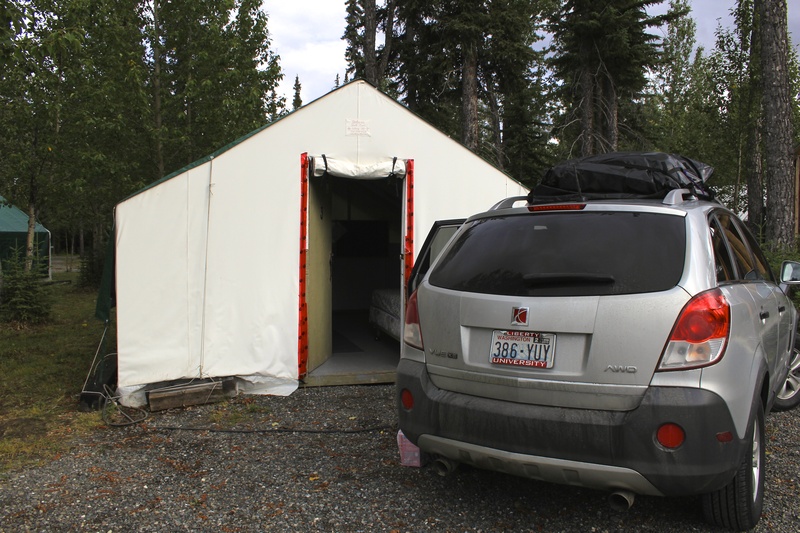 My home for the night (the tent, not the car) at Discovery Yukon Lodgings. 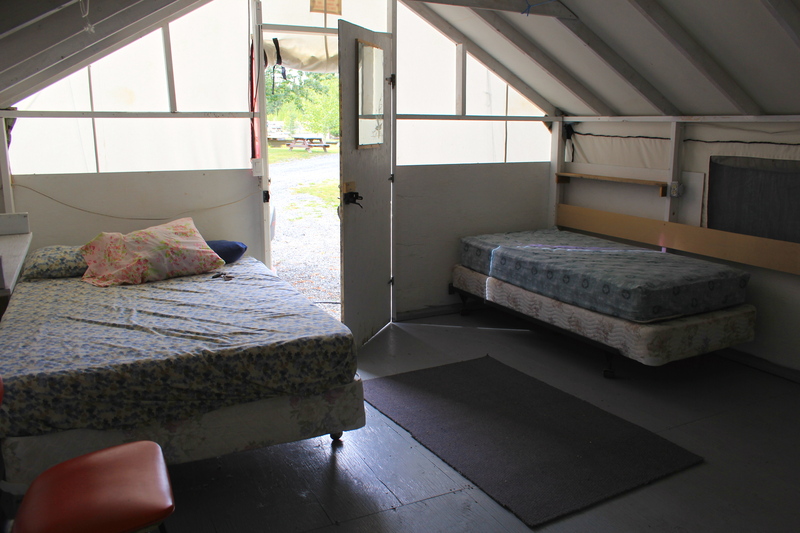 I totally recommend this campground (they have cabins too!) 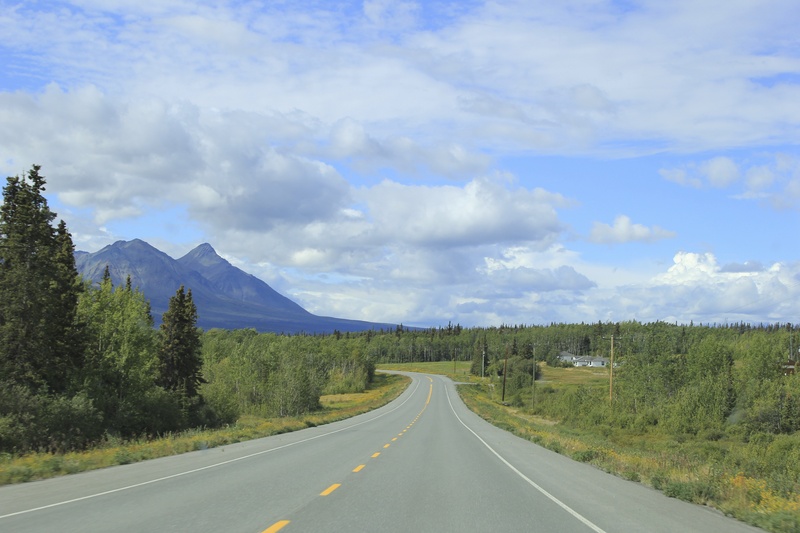 for anyone traveling the Alaska Highway in the future. It’s a bed, a real bed! By 9:30 I was so wiped out I was more than ready for bed however I looked up and there was a spider on the ceiling directly above me. Oh no, that was not going to work. I jumped out of bed and did my best to explain to the spider that it needed to leave or I was going to be forced to kill it. This went on for 20 minutes, 20 minutes! I really tried but unfortunately in the end the spider had to meet its maker, I just couldn’t sleep otherwise. The funny thing was though, as soon as I killed the spider I began to hear howling outside. I thought “it can’t be…nah…..wolves??? wolves!” and a whole pack of them by the sound of it (at this point I was really VERY happy that I had opted not to sleep in my tent). They could have been half a mile away, I’m not sure, but they sounded a lot closer, like feet away. Way to close for comfort. My thoughts? Toto, we’re not in Kansas anymore. 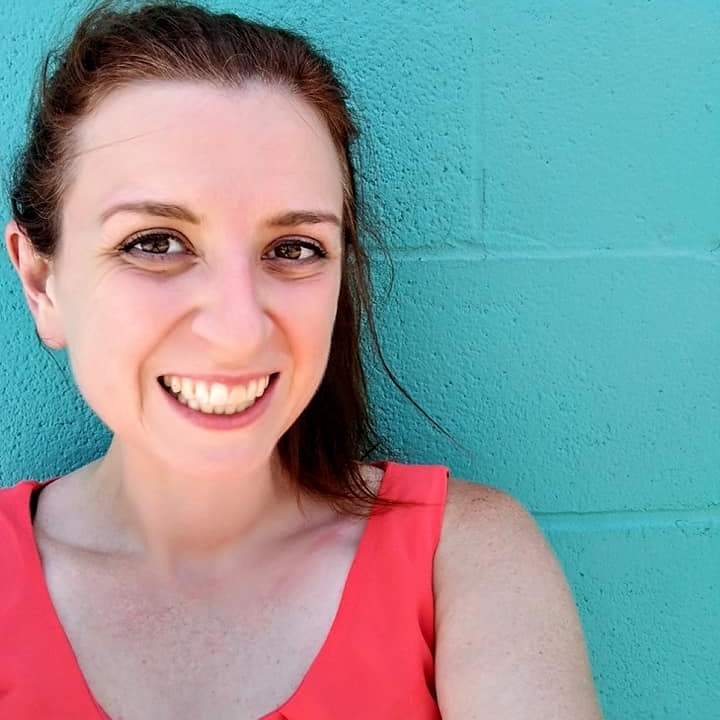 Stay tuned for one more blog post as I wrap up the journey with days 5 and 6! 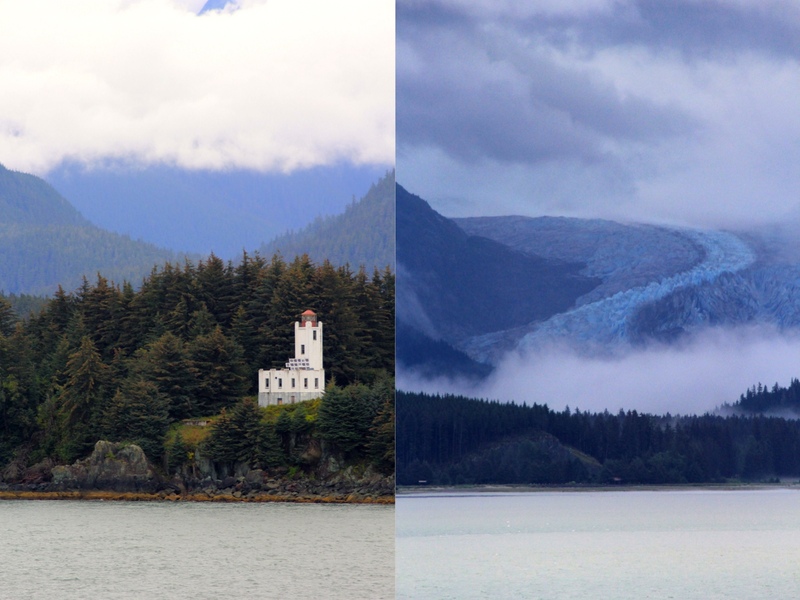 Categories: Adventure, Alaska, Life, Travel | Tags: AK, Alaska Ferry, Alaska Highway, Alaska Marine Highway, Alcan, Amanda Dorough, Bellingham to Haines, Haines, Haines Highway, Lake Kluane, M/V Columbia, Yukon | Permalink.